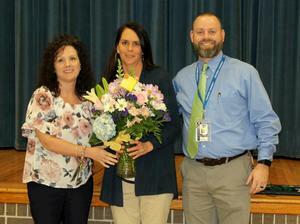 Congratulations to Mrs. Marjorie Ganey, our True Blue Support Staff of the Year! 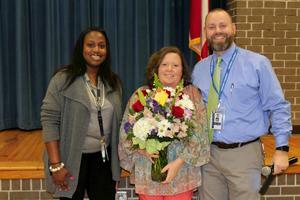 Congratulations to Mrs. Deborah Bruce our Teacher of the Year! GMAS is right around the corner!!! Click for information and helpful resources. Track Meet has been canceled and rescheduled for March 5th. Click here to fill out the Parent Survey after you attend your Bridge Day meeting for your child. 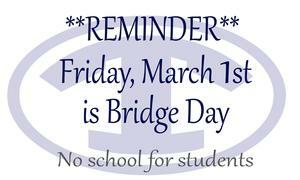 Don't forget that Friday, March 1st is Bridge Day so there will be no school for students. Parents of students at Eighth Street Middle School, Northeast Middle School and Tift County High School, make sure you have scheduled an appointment for your student's advisement. To find out more information about Bridge Day, visit https://www.gadoe.org/Curriculum-Instruction-and-Assessment/CTAE/Documents/BRIDGE-separate-card.pdf. Working Hard to Achieve those Goals!!! 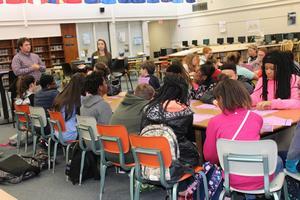 Students learned about what all 4H can offer, events they can attend, and the benefits of being a part of 4H. Please click for a letter from the Principal and permission form.